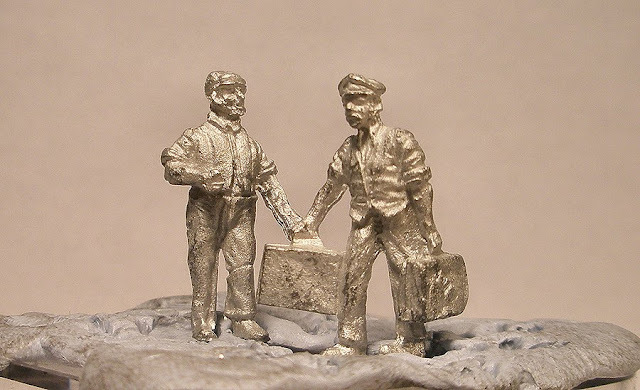 I've been exploring some of the smaller and lesser known 4mm whitemetal figure ranges recently. Here's a handful of photos showing a selection of some of them. These are cruel close-ups, but if we're concerned about the details of our stock, shouldn't we be equally concerned about whether the figures look right? 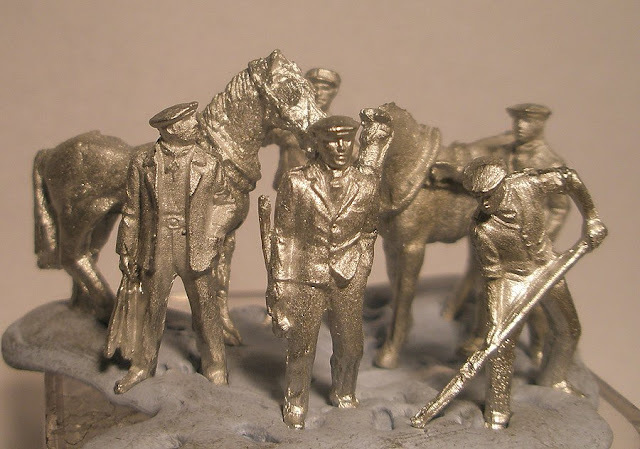 Above: This group of horse shunters are from the Geoff Stevens range, which features sets of railway staff that can be used together in little cameos. 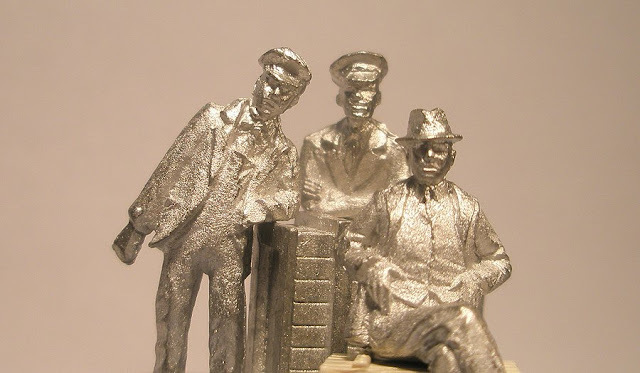 As evident from the header photo, some of the figures in this range have well sculpted faces. 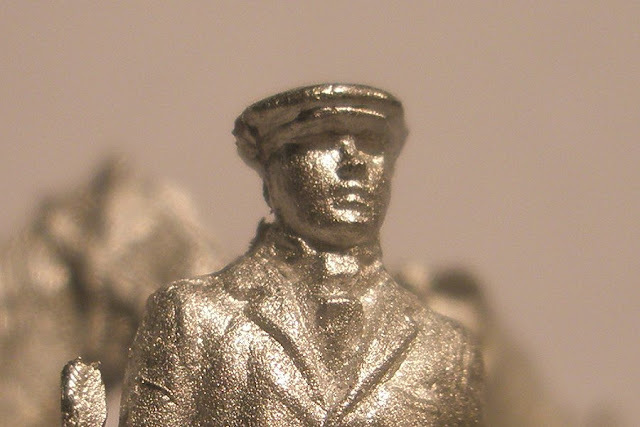 Very often, I think, it is the face that makes or breaks a 4mm figure. Above: No, not a fight but a sheeting gang, also from Geoff Stevens. I am not normally attracted to figures that are frozen in mid-motion, and cameos like these can very easily become a cliché. 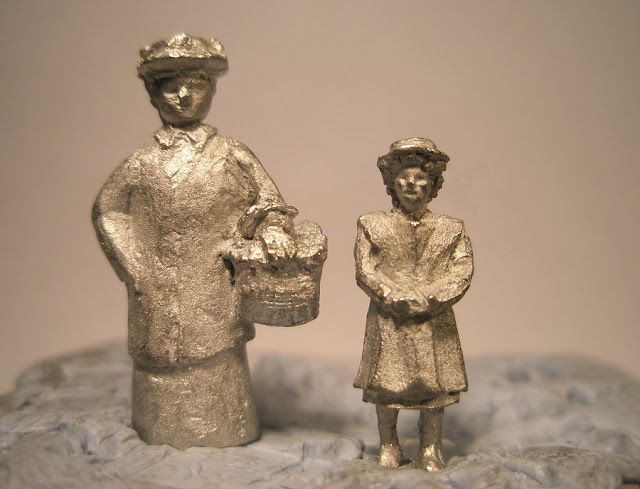 However I couldn't resist the two sets pictured here, which fit well with a concept I have in mind for a future third layout in the Farthing series. 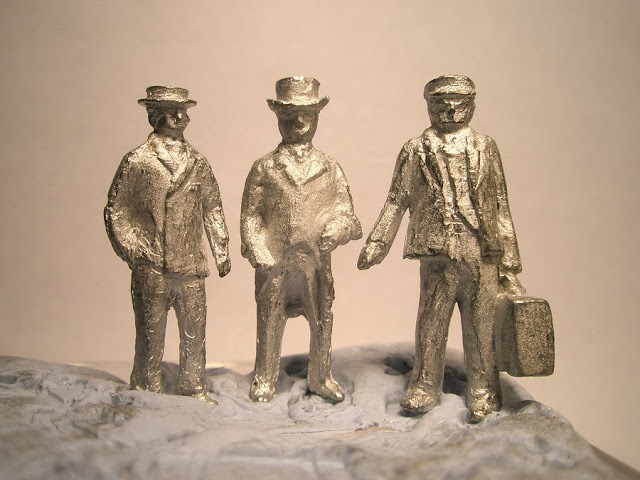 Above: These figures are from Model Railway Developments (MRD). I've been wanting to have a closer look at these for some time, as the range is focussed on my own Edwardian period. 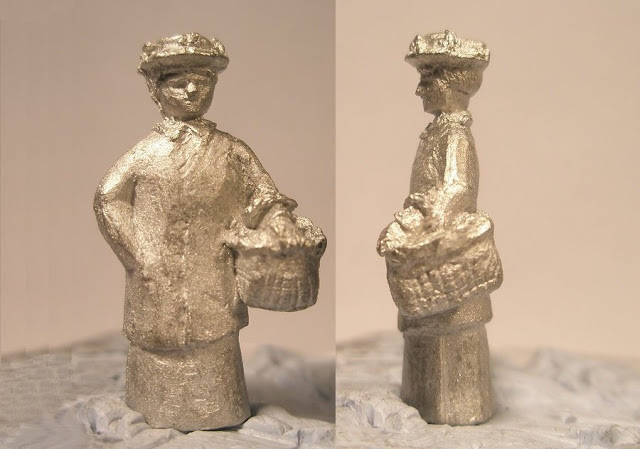 Above: The same figure seen from two different sides. Quite often, I find, a figure can look unrealistic from one side but quite good from another. I wonder if this has something to do with the original sculpting process? In any case, careful positioning can sometimes bring out the good side in a figure. Above: Two porters, also from Alan Gibson. I might change the pose of these, but the faces have a certain character! Captions, anyone? 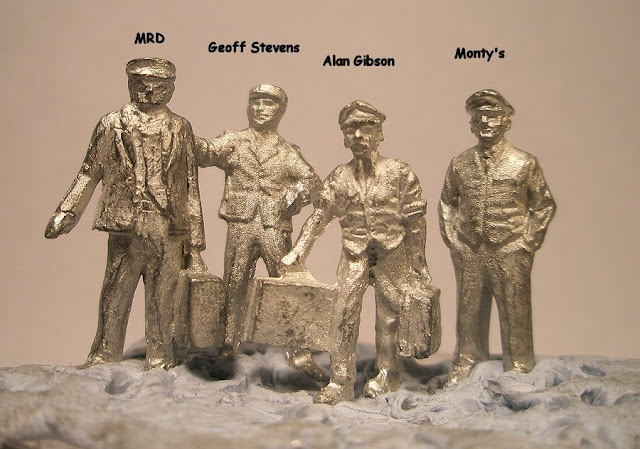 Above: A line-up of station staff from the above ranges, plus a figure from the better known Monty's range from Dart Castings. Above: Clearly there's a dinner party nearby! Another comparison here, with a couple from the large Langley range thrown in. 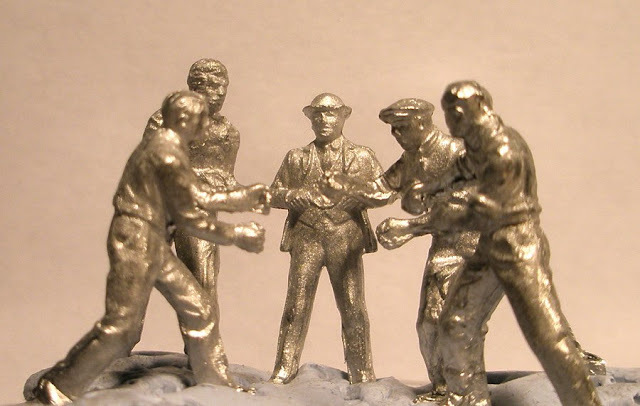 Above: A group of Monty's figures. 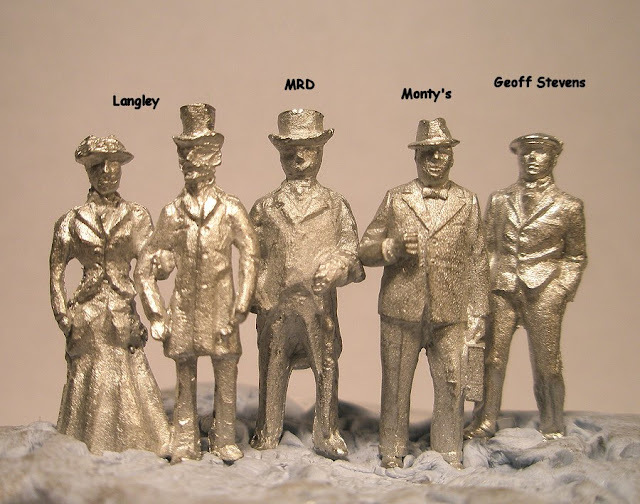 While there are individual useful figures in all of the above ranges, they don't trump the Monty's range, which in my view wins hands down every time. 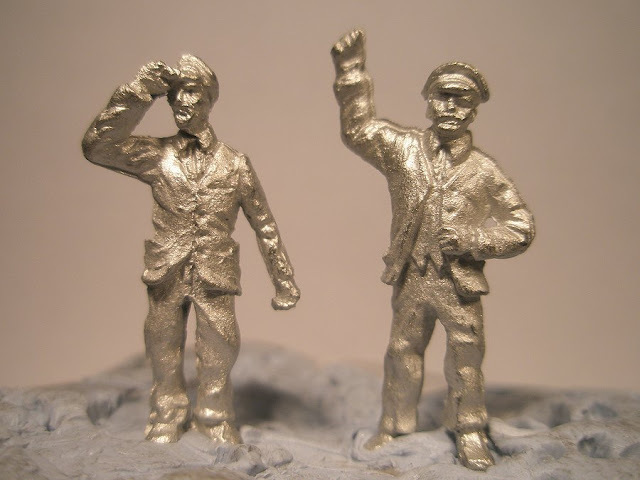 They have the right bulk, relaxed poses and the faces are usually good.